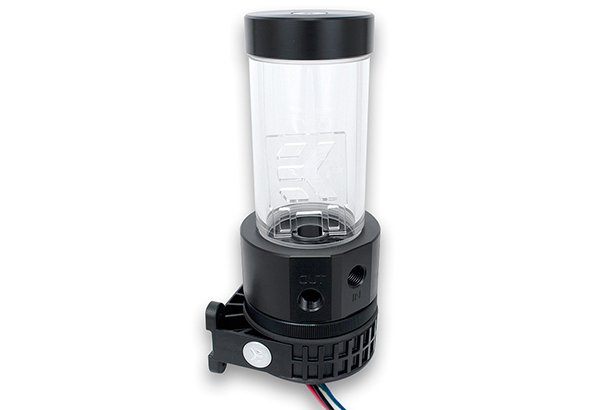 Should I get pump reservoir combo or should I buy them separately? or pump reservoir combo (right). In short, it is all the same! 🙂 Basically, you should get whatever suits your build or case the best. 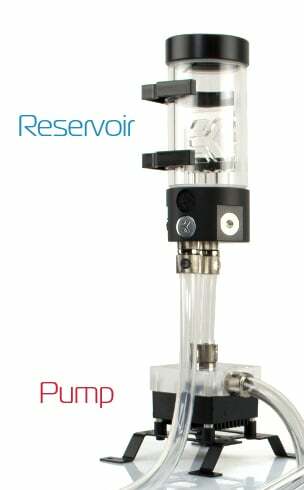 But first, let’s talk about the reservoir pump combo. 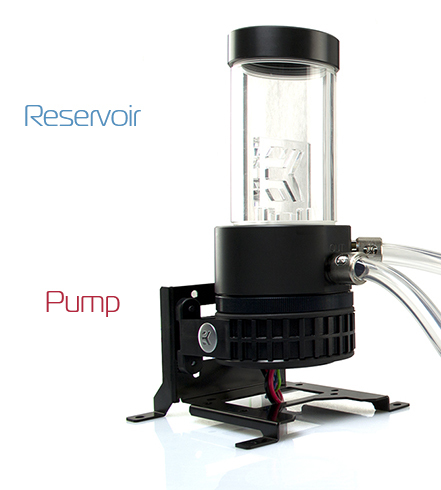 The reservoir pump combo is what we can simply describe as “fail proof” concept. The coolant will always be at the right spot for the pump to operate without any problems. There are several types of combo units that use the classic cylindrical reservoir and there are the so called “bay” pump reservoir combo units. Bay pump reservoir combo (left) and cylindrical pump reservoir combo (right). With the classic cylindrical reservoirs, the reservoir itself sits above the pump, so that coolant is always present, since running the pumps on dry could harm them. You should look for the one that suits your needs best, and be sure to check for the size you need and for the combo unit to have the proper mounting equipment. In the case of a combo like this, there are four main parts that make a whole unit. You have the cover itself, an acrylic cylinder, and the pump top which can be fitted with the acrylic cylinder and the pump itself. We could count the mounting bracket as the fifth piece, since it is equally important. A combo unit like this is often very handy, because the acrylic cylinder is interchangeable so you can pick various lengths. 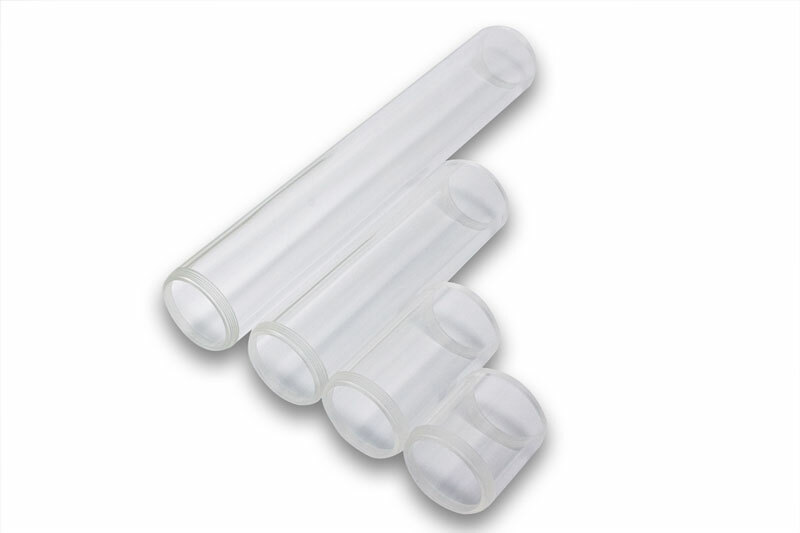 Replacement tubes of various lengths for EK-XRES pump reservoirs combo units. You don’t need to get rid of your combo system if you move to a bigger case, or vice versa when you go for a smaller build. Another benefit of a system like this is easy disassembly and maintenance. The bay reservoir is unwillingly going out of fashion because there are more and more cases that are ditching the 5.25” bays. 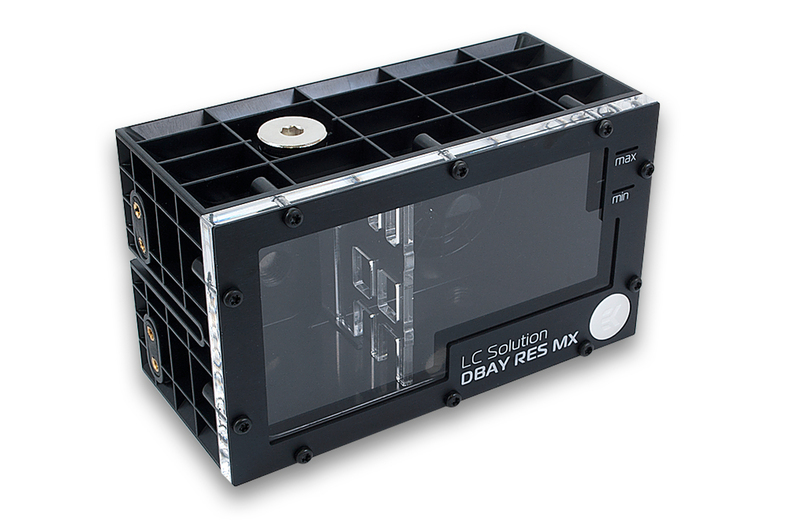 And that is exactly why they are called “bay” combo units – they are using one or more 5.25” drive bays that are mainly meant for CD/DVD or other optical drives. The most common sizes of bay pump reservoir combos use one or two 5.25” bays, and sometimes you can see bigger models. A feature that is mainly offered by the bay combo units is that they can accommodate two pumps, often a double DDC setup, but in some cases, even a dual D5 setup can be used. Some models of bay combo units even have a flow meter, a temperature gauge, or both installed. An important thing about the bay pump reservoir combo units is that there is almost always a “min” and “max” label for the coolant that must be respected. What’s more, the potential downsides of these types of combo systems is the lack of upgradability. Once you have bought the bay combo unit, that’s it, they cannot be resized by interchangeable parts. D5 pump mounted on the back of bay unit. Maintenance can also be an issue. Bay combo units have the fill port on the front or the top, and both of these types require some fiddling for a simple refill. Either you have to pull out the combo unit from the 5.25” bays to access the fill port on the top, or you have to tilt your case backwards if the fill port is on the front. Cleaning the bay pump reservoir combo system can also be tricky for novice users, since special care must be taken of the o-rings and other rubber seals and gaskets. 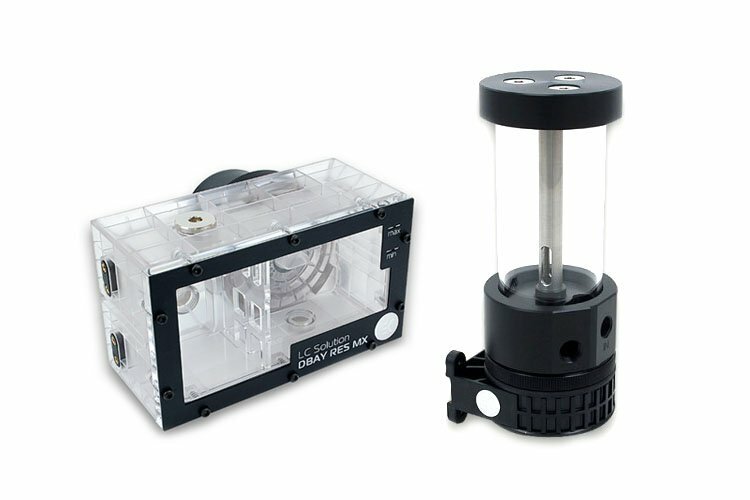 Both the classic combo units that use cylindrical reservoirs and the bay combo systems are compatible with all three main types of pumps, meaning the D5, DDC and DCP models. All types of combo units will make your build a bit cheaper, save you a few fittings and some unnecessary tubing. A pump reservoir combo unit almost always shares the mounting mechanism. 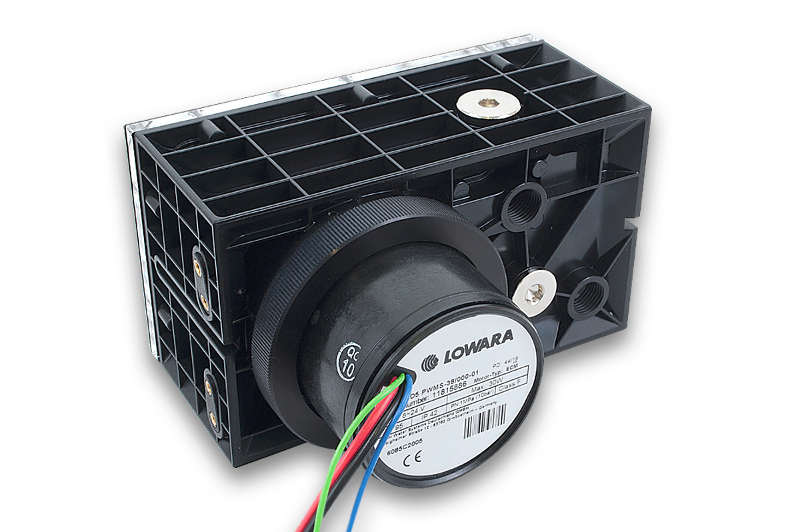 As for separate solutions, both the pump and reservoir need their own installation gear. There are two main types of reservoirs: the classic acrylic cylindrical, and the bay reservoir. At this point, after we talked about the combo units, we believe it is not necessary to repeat the differences and benefits of these two main types. It is all the same, just without the pump. When it comes to reservoirs, both standalone or combo units, it is best that you chose a model that has any sort of anti-cyclone solution. The anti-cyclone insert is often important so that you don’t get the “tornado” inside of the reservoir, which can result in air being sucked trough the loop and getting stuck in water blocks and radiators. Remember, you will not enjoy any benefits in performance if you go for a combo or rather a standalone reservoir and pump setup. The choice is down to you and what suits you the best, based on functionality or looks. The important thing is that you know what your choices are, which we hope is covered by this article in detail. Deep Red by Brian Stroh How to correctly apply the thermal interface material (TIM)?